he Chilliwack RCMP would like to extend a very big thank-you to the community for their generous support of a disabled lady who had her scooter stolen in a break and enter. Thanks to many generous donations, Mrs. Scowtrost was given a brand new scooter. "Within minutes of this story airing on the news, we had people driving to and calling the detachment wanting to help," said Cst. Tracy Wolbeck. "In my time in this position I have never seen anything like this. It has really restored everyone's faith in the human condition. Mrs. Scowtrost has been overwhelmed with the public response to her situation and it was a really amazing situation for all of us to be involved in." 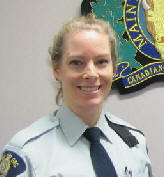 On June 15, 2012, the Chilliwack RCMP were made aware of a disturbing theft that occurred some time between February 3, 2012 and March 10, 2012. The 63 year old victim of this theft had her motorized scooter stolen which is specifically designed for disabled persons. This item was taken from her residence while she was in hospital recovering from severe injuries she sustained in a car accident. The victim alerted police after she had spoken to all of her friends and family members to ensure that none of them had removed the scooter. "The victim mentioned to me that anyone entering her residence could tell that she was a person living with a disability," said Cst. Tracy Wolbeck. "The motivation behind stealing an item like this is not monetary, it's really just mean spirited." The item was stolen from an apartment building on Wellington Avenue and due to the time delay in reporting, police have no leads on any possible suspects. This crime has significantly impacted the victim in this case. It does not appear that any other items in the residence were disrupted. If you have any information regarding this incident, please contact the Chilliwack RCMP at 604 792-4611 or Crime Stoppers at 1-800-222-8477 (TIPS).